Node.js does provide pre-built installers for all platforms but here we are going to talk about how to install and prep your PC for Node.js development when you don’t have administrator rights. Step 1: Get Node.exe First you will need to download the Windows Binary. You can get it from Node.js download page or http://nodejs.org/dist/latest/. For x64, you will have to download from the appropriate folder. Move the executable to a local folder. Step 2: Get NPM NPM (Node Package Manager) is the package manager for Node.js and you will need this for your development. You can download NPM from https://github.com/npm/npm/releases and extract the zip file to a local folder. Step 3: Configure the environment PATH variable. You need to set up the PATH variable so that you can call node from anywhere in the system. 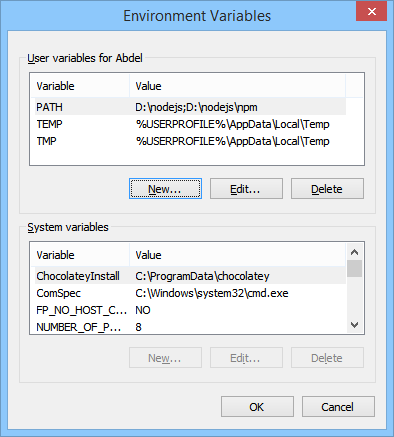 This command will provide you with Environment Variables dialog box. You will be able to add/modify the PATH variable for the current user.